The utterly charming village resort of La Tzoumaz is situated in the midst of the Swiss Alps, in the canton of Valais in the south-west of Switzerland. Valais is home not only to the famous Matterhorn peak, one of the most iconic mountains in the world but also to some of the most spectacular alpine panoramas you could ever wish to see. The region is also where you will find some of the best-known and most luxurious winter resorts, such as Zermatt, nestled in the shadow of the Matterhorn, and Verbier, a favourite skiing destination for the British Royal Family. La Tzoumaz has an alpine heritage that is hard to beat. The village is a part of the Les Quatre Vallées (meaning four valleys in English), the largest ski resort in the country. 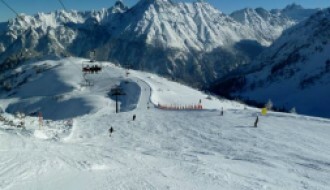 Les Quatre Vallées, more commonly known as just 4 Vallées, has a deserved reputation as one of Europe’s most elite resorts. Its facilities and amenities are truly world-class and regularly maintained and improved. This is something the prestige Swiss resorts are known for. 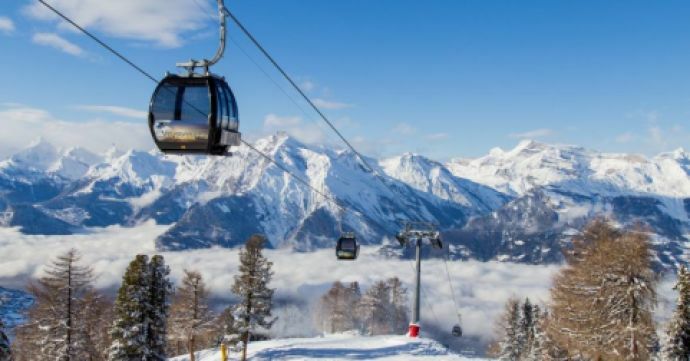 As well as exploring the 60km of slopes in La Tzoumaz itself (which are north-facing and tend to keep the snow for longer), you are only a high-speed gondola ride or two away from the other five resorts in 4 Vallées, namely Verbier, Thyon, Nendaz, Veysonnaz and Bruson. All told, these resorts provide more than 400km of slopes, ranging from 800 to 3,300 metres, and of course catering to beginners, intermediates and experts. There are also plenty of off-piste options for more adventurous visitors. 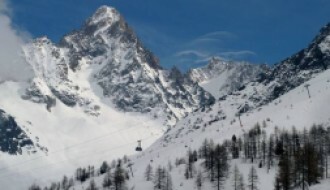 Access to this winter sports heaven is easy, as a free ski bus is provided from the village to the lifts. For something a little different, there is a 10km toboggan run (the longest of its kind in French-speaking Switzerland) that takes you down into the village, dropping almost 1,000m in altitude. Adults and children can ride this but note that helmets must be worn, as the run is pretty thrilling, with no lack of fast corners! Snowshoe hiking is also an option, and you can choose from three different paths that cover almost 15km. The village also has an indoor heated swimming pool, an ice rink and a tennis court. Recent updates to the area include a new downhill track in the expansive Verbier Bikepark, a must-do for mountain bikers. In summer, the area blossoms in the sunshine, and you can swap out the skis for hiking boots and mountain bikes, or sit back with a glass of wine from the nearby Rhône Valley - an area that is renowned for its excellent wines - and simply enjoy the breathtaking views. In comparison with Verbier, a skiing hub for the rich and famous, La Tzoumaz is more down to earth, relaxed and generally feels more welcoming. The main selling point of La Tzoumaz is its five-star location, set in the heart of a region that is favoured by royals and celebrities alike. But with a residential population of only 300 people, La Tzoumaz is very much the most peaceful jewel in the 4 Vallées crown, which makes it a wonderful base, particularly for families. It doesn’t get as crowded as the likes of the flashier Verbier, and neither is it as expensive. So, if you are thinking about buying a property in La Tzoumaz, consider that you would be getting the best of both worlds: the bright lights of nearby resorts and the relaxed charm of the village itself. Many of the properties in the area reflect that win-win nature - they are designed in the traditional Swiss style but built with ultra-modern, high-quality materials. With La Tzoumaz, you are buying into a heritage and culture that is first-class and will last for lifetimes. With its north-facing slopes, La Tzoumaz has a reputation as one of the most snow-blessed pistes in the Swiss Alps. The most recent full snow report, taken from the 2017/18 ski season, shows that La Tzoumaz received a total snowfall of 341cm, with a maximum base depth of 125cm and a maximum summit depth of 240cm. The average snow base depth was 87cm, with an average summit depth of 154cm. That season, La Tzoumaz experienced 28 snow days in total, with the biggest snowfall recorded at 40cm. Of course, with so many excellent resorts nearby, there are plenty of other options should conditions waver. For the latest snow report from the region, take a look at our La Tzoumaz resort guide page here. As for its general climate, La Tzoumaz enjoys average monthly temperatures ranging between -1°C during the winter (January) and 15°C in summer (July). To see an up-to-the-minute weather report for La Tzoumaz, visit our resort guide here. The nearest international airport to La Tzoumaz is Geneva (150km away). From there, hiring a car is the easiest way to reach the village, and the drive should take around two hours. Public transport is also an option, with well-maintained trains running frequently from Geneva to Le Chable. 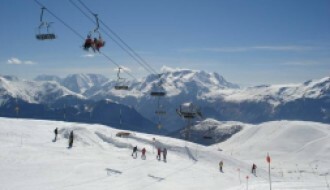 From Le Chable you can take a gondola into Verbier and then another on to La Tzoumaz.